Summary: A new paper reviews some of the possible psychological and neurological disorders experienced by characters in Alice in Wonderland. The moment Alice arrives in Wonderland, she goes through a series of strange metamorphic changes, becoming larger or smaller after ingesting certain foods and liquids. These sensations are also experienced by individuals with a certain medical condition termed Alice in Wonderland syndrome (AIWS). AIWS was first described in 1955 by a British psychiatrist Dr. John Todd, who noticed that many of his younger patients experienced distortions in the size of objects or body parts (metamorphopsia) as a result of their migraines. He noted a strong association between these symptoms and migraines, and determined that AIWS may constitute a rare ‘migraine variant’. In fact, Lewis Carroll himself is reported to have suffered from migraines and manifested his experiences in his writing. For instance, Alice being blinded by moonlight may refer to the tendency of bright light to stimulate or intensify a migraine. AIWS is commonly experienced during childhood and tends to disappear during teenage years. In addition to distortions of size, patients may also experience changes in the shape or distance of objects and a distorted perception of time. These sensations may be accompanied by a lingering of sensory input, such as auditory or tactile sensations after the source has been removed. A migraine aura is a perceptual disturbance that precedes the migraine headache, but in some cases the aura may be experienced alone. The aura typically develops over 5 minutes and can last up to 2 hours. Although its exact cause is unknown, it may be due to a slow propagation of excitation followed by a depression in neuronal activity across the cerebral cortex (the outer layer of the brain). This phenomenon is called ‘cortical spreading depression’ and often originates in the visual or somatosensory cortex, moving across the cortex at a rate of 3.5mm per minute. It is thought that when this ripple of overstimulation and subsequent depression of neuronal activity passes over the parietal lobe, it caused an altered perception of the size of objects and body parts, along with misperceptions of tactile and auditory sensations. The parietal lobe, a brain region responsible for integrating sensory information, creates the perception of our body parts in space (proprioception). It has thus been implicated in some of the symptoms experienced in AIWS. For example, electrical stimulation of the posterior parietal cortex has been shown to produce disturbances in body image, such as hallucinations of limbs growing or disappearing. In addition, a functional MRI (fMRI) study of a 12-year old with AIWS showed increased activation of the parietal lobe accompanied with reduced activation in visual cortex areas during an episode of metamorphopsia. This suggests that metamorphopsia in AIWS patients is a result of enhanced neuronal activity within the frontal lobe, resulting in disrupted integration of sensory information and misperceptions of body parts in space. At several points in the story, Alice questions her own identity and feels ‘different’ in some way from when she first woke. Approximately 1% of the UK population experience these feeling constantly, and suffer from a syndrome known as depersonalisation disorder (DPD). DPD is characterised by a disruption in the integration of perception, consciousness, memory and identity, producing a disordered and fragmented sense of self. This disorder encompasses a wide range of symptoms, including feelings of not belonging in one’s own body, a lack of ownership of thoughts and memories, that movements are initiated without conscious intention and a numbing of emotions. Patients often comment that they feel as though they are not really there in the present moment, likening the experience to dreaming or watching a movie. These symptoms occur in the absence of psychosis, and patients are usually aware of the absurdity of their situation. DPD is often a feature of migraine or epileptic auras and is sometimes experienced momentarily by healthy individuals, in response to stress, tiredness or drug use. There is a high association between DPD and childhood abuse, and the onset of symptoms often coincides with stressful or life-threatening situations, which indicates it may initially arise as an adaptive response to an overwhelming situation. DPD acts as a sort of defence mechanism, allowing an individual to become disconnected from adverse life events, making the situation easier to deal with. In fact, it is estimated that 51% of patients with DPD also meet the criteria for post-traumatic stress disorder (PTSD). The temporoparietal junction (TPJ) is involved in integrating sensory information to create the feeling of being located in a particular body in a particular space. As well as the feeling of not belonging in their body, people with DPD may also have out-of-body experiences (the feeling that the ‘self’ is located outside the physical body) and experience autoscopy (the perception of viewing the self from another vantage point). Evidence for the involvement of the TPJ in DPD comes from studying brain lesions. It has been shown that neuronal degeneration of the TPJ produces out-of-body experiences, possibly due to a failure to integrate multisensory information from the body. Likewise, transcranial magnetic stimulation (TMS) of the right TPJ reduces symptoms of depersonalisation. People with DPD also have reduced activity in an area of the brain called the anterior insula which is located deep within the brain and necessary conscious processing of emotions and creating a sense of agency (the feeling of responsibility for your own actions). Studies have shown that activation of the anterior insula occurs when healthy subjects are shown photos of their face or body, implicating this area in bodily representation and feelings of ownership. In a fMRI study, participants were asked to control images on a screen using joysticks. When the participant felt as though they were responsible for moving the object, there was a corresponding increase in activity in the anterior insula. However, when researchers interfered with the movement of the object, the participants showed greater activity in the inferior parietal cortex. Reduced basal activity in the anterior insula of people with DPD offers a possible explanation for the loss of agency and robotic, automated movements which are experienced by individuals with DPD. Reduced activation of the anterior insula may also be responsible for the emotional numbing experienced by these patients. For example, patients with DPD displayed a lack of response when shown emotionally-provocative images, accompanied by reduced activation in the anterior insula and a dampening of the galvanic skin response (GSR) as compared to controls. The GSR is a measure of subconscious arousal and is therefore often used as a quantitative measure of emotional response. At several points in the story, Alice questions her own identity and feels ‘different’ in some way from when she first woke. NeuroscienceNews.com image is credited to John Tenniel and is in the public domain. Another brain region implicated in emotional awareness is the amygdala, which also displays dampened activity among DPD patients. The amygdala is thought to ‘colour’ conscious perceptions with emotion and plays an important part of how we perceive our environment. It has been suggested that the process of perception may occur by two parallel pathways. The first is concerned with the literal, semantic processing of the environment – the ‘what is it?’ pathway. The second pathway assigns emotional significance to this information. In people with DPD, the ‘what is it?’ pathway is intact, however the emotional pathway is disrupted. This may cause patients to feel that things seem somehow different and unreal. Therefore, patients with DPD are able to recognise themselves, their families and their environment. However, as the emotional ‘colouring’ of the situation is lost, everything appears foreign and lifeless. As Alice says her goodbyes to Humpty Dumpty, he gives her a precise description of prosopagnosia, a rare form of agnosia characterised by the selective inability to recognise faces. Whether Carroll based Humpty Dumpty’s prosopagnosia on a real person or was simply a fragment of his imagination is unclear. Regardless, this account is possibly one of the earliest descriptions of this neurological syndrome in the literature. Humpty describes his impairment in recognition of familiar faces, even though he is aware of the general organisation of a face and is able to correctly identify the position of facial features. Prosopagnosia is either caused by brain trauma (likely the result of Humpty’s great fall), stroke or neurodegeneration or it may manifest in childhood. Prosopagnosia has been shown to be strongly hereditary although any causative genes are yet to be discovered. People with prosopagnosia tend to rely on discriminating features to tell people apart, such as hairstyle, glasses and the presence of moles or the sound of their voice. Affected individuals also have difficulty recognising themselves in the mirror, as well as following plot lines when watching films. Due to the fact that the brain links information learnt about people to the visual memory of that person, it can be difficult for prosopagnosics to attribute specific information to the right people and socialise normally with others. This can result in social withdrawal, anxiety and loss of confidence in social situations, which is fuelled by a lack of awareness of prosopagnosia in the general population. In one such tragic condition, a patient developed severe prosopagnosia following a stroke. His condition compelled him to isolate himself from society and move to a remote area to work as a farmer. He learned to recognise and tell apart his sheep, but never regained the ability to recognise human faces. Prosopagnosia has been linked to damage in the fusiform gyrus, an area of the brain located in both the occipital and temporal lobes, which is responsible for retaining visual memories. A localised region within the fusiform gyrus, termed the fusiform face area (FFA) retains the facial images of people we have met throughout our lifetime, and this is the area affected in prosopagnosics. fMRI studies have shown a strong activation of the FFA when participants are shown photos of faces, as compared to other visual stimuli. Amusingly, experimental electrical disruption of the FFA causes distortions when visualising faces, an effect similar to viewing oneself in a fun house mirror. In one such study, the participant looked at the experimenter and exclaimed, “You just turned into someone else! Your face metamorphosed. Your nose got soggy and went to the left. You almost looked like somebody I’d seen before but somebody different.” Interestingly, this effect was only experienced when current was applied to the right fusiform gyrus, implying that facial recognition is dominated by the right hemisphere. There is evidence that the FFA may process not just faces, but any familiar visual stimuli in which the brain has to distinguish between minute features. For instance, one study compared the facial recognition activity of car enthusiasts, expert bird watchers and the general public. All groups showed FFA activation in response to faces. However, the FFA was also activated when car enthusiasts were asked to identify different cars and the bird watchers asked to identify different species of birds. It appears that because we encounter so many similar faces in everyday life, the FFA has become specialised for facial recognition but can equally adapt to distinguish a variety of objects. The recognition of faces depends not only on the ability to correctly match the visual image of a face from the catalogue of faces stored in our memory, but also on the emotions which we associate with a familiar face. Whilst the fusiform gyrus is responsible for the visual recognition of faces, it appears that other higher brain centres provide the emotional response when seeing a familiar face. Tranel and Damasio (1985) conducted an experiment in which patients with prosopagnosia were shown photos of family members, familiar figures and hospital staff, interspersed with faces of strangers. Although both patients reported an inability to recognise any of the photos, a significantly stronger GSR, indicative of an unconscious emotional response, was produced when the participants were shown photos of loved ones. These findings suggest that the normal process of facial recognition occurs by two distinct circuits, the first involving the conscious awareness of a particular face due to retained imagery in the FFA, and secondly an unconscious emotional familiarity mediated by higher brain regions (particularly the frontal and parietal lobes). In prosopagnosics, the emotional circuit is intact, so the patient is able to detect familiar faces ‘unconsciously’ but the brain fails to pass on this information to higher brain centres. Therefore, the condition of prosopagnosia appears to reflect a structural disconnection between areas of the brain involved in recognising faces. The opposite scenario is reflected in a condition known as ‘hyperfamiliarity’. In this disorder, the patient has a strong ‘gut’ familiarity with people and places due to strong activity in emotional centres, and may even go up to people to greet them as old friends, even though the individual cannot recall meeting these people in the past. A more common phenomenon of familiarity without awareness is déjà vu. Despite the fact that symptoms of Alice in Wonderland syndrome, depersonalisation and prosopagnosia can be distressing, they provide insight into the neural mechanisms which produce fundamental processes such as consciousness and perception which we ordinarily take for granted. Through slight changes in neural activity in relatively localised brain regions, phenomena can arise which are as peculiar and fascinating as those experienced by Alice when she first fell down the rabbit hole. Note: This article was submitted to Neuroscience News by Rachel Butterworth of The Tutor Pages. We would like to thank Rachel for the submission. About the Author: Holly Barker is a Chemistry and Biology tutor in Brixton and is with The Tutor Pages. Image Source: NeuroscienceNews.com image is credited to John Tenniel and is in the public domain. Video Source: Video credited to Grill-Spector et al./Journal of Neuroscience. The Tutor Pages “The Neurological Disorders in Alice in Wonderland.” NeuroscienceNews. NeuroscienceNews, 12 January 2018. The Tutor Pages “The Neurological Disorders in Alice in Wonderland.” http://neurosciencenews.com/alice-wonderland-neurology-8307/ (accessed January 12, 2018). This is quite revealing. Alice had a sort of unreal experience, immediately she went down the rabbit hole. Some people under the influence of drugs and certain medications suffer from AWS . 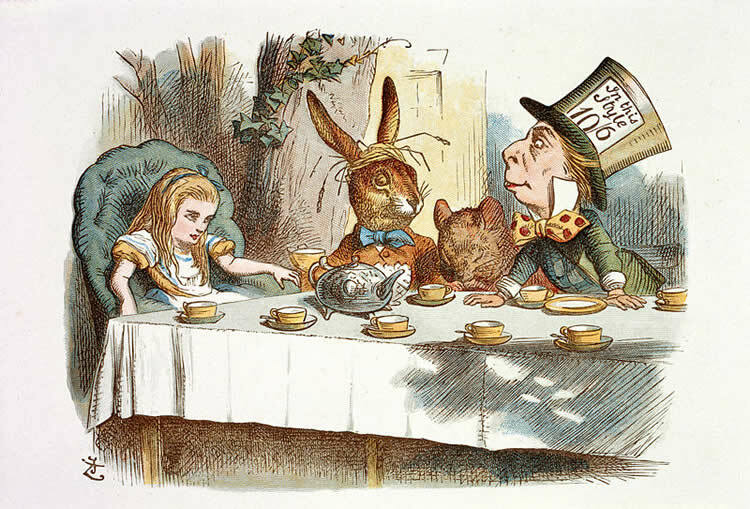 The issue of mercury poisoning in Alice in Wonderland has to do with the Mad Hatter. There was and is an expression in English “as mad as a hatter’, which originated from the fact that many hat makers were “crazy” (one of the consequences of mercury poisoning). And, at that time, there was a lot of mercury poisoning among them because felt carroting (a preparation of felt for the top and other hats) was an operation in hat making, which involved mercury (and was uncontrolled). Hence the expression, hence the Lewis Carroll hatter character. I loved my AWS. It started when I was about five and it never occurred to me it was a problem. I loved what it did to the world. I don’t think it came up in discussion until I was about ten and my mother (an art teacher) tried to explain that there weren’t thick black lines around people in real life, and I responded “yes there are”. By the age of 11 I had full blown migraine: not so much fun. At 30 tho I was diagnosed with coeliac and my migraine went. So, sadly, did much of the AWS. I can bring it on if I try, but it doesn’t shape my world the way it did. Very clear and precise, thanks for sharing, from this, emerge mire reasons for studying our brain. I never ever thought that there was anything queer about Alice. I simply thought it was refreshing because it talked out things as they are, and was witty. My favourite is the Red Queens who said that is you want to get anywhere you have to run twice as fast as possible! oh, an Humpty Dumptyand hos brilliant “It depends who is the master — you or the words”.